Delaware Arts Info: Call for Artists: Wilmo Comic Con! 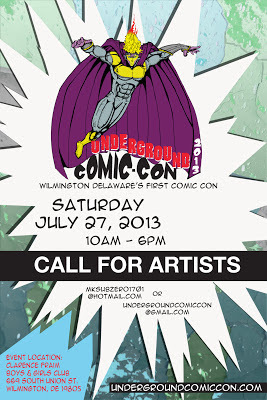 Wilmington's very first comiccon will hit the town in July 2013 as Underground Comic-Con! Organizers are seeking a few good artists & vendors to exhibit. Visit the website – www.undergroundcomiccon.com – for more details and an application. Stay tuned for more fun info as we get it! We are geering up for a great day - contact Alison at Undergroundcomiccon@gmail.com for more information.